Jenny’s Basketique, LLC can help with almost every service needed for the big day. Our products offered include all types of event stationary, decorations, favors, and gift baskets and gifts. We also offer wedding accessories and partyware. Ask us how we can help with the bachelorette party too. We offer custom packages and ship ANYWHERE in the United States. Rush service is available. At Jenny’s Basketique, our goal is to work directly with our clients to custom-design their event stationary, decorations, favors, wedding accessories, and gifts to coordinate with the style, theme and colors of their special event. Event stationary is custom-designed, printed, assembled and delivered directly to our clients. Favors and gift items can also be custom-made and personalized with names, dates, images, quotes, etc. Printed favors are custom-designed and printed specifically for our client’s event. Wedding accessories can be custom-made to reflect a specific style and specific colors. They can also be personalized with images, names, dates, etc. Our gift baskets are customized for each individual receiving the gift and can be made to coordinate with the wedding theme as well. Gift baskets are excellent gifts for family and friends, such as for the bridesmaids and out of town guests. Stationary - save-the dates, invitations, reply cards, programs, place cards, announcements, thank-you cards, etc. Decorations - balloon decorations, floral, non-floral, and edible centerpieces, arches, props, specialty lighting, live plants, candles, ribbons and bows, and confetti. Favors – printed (such as a poem or card), edible, and personalized (key chains, picture frames, playing cards, etc.). Gifts – gifts and gift baskets, balloons (single or bouquets), greeting cards, and flowers. 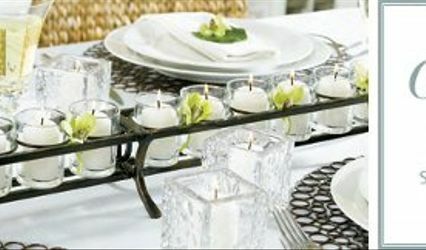 Partyware - table and drinkware, personalized napkins, chair covers, linens, and guest towels. Open 7 days a week - 9:00 a.m.-6:00 p.m.